Help us choose a new Clinic logo! Please visit our Facebook page to vote on your favorite logo! Today the Clinic submitted a petition to EPA on behalf of Waterkeeper Alliance for the suspension or debarment of ExxonMobil, arguing that the company's decades-long misinformation campaign regarding climate change and history of environmental violations should preclude the company from doing business with the United States Government. 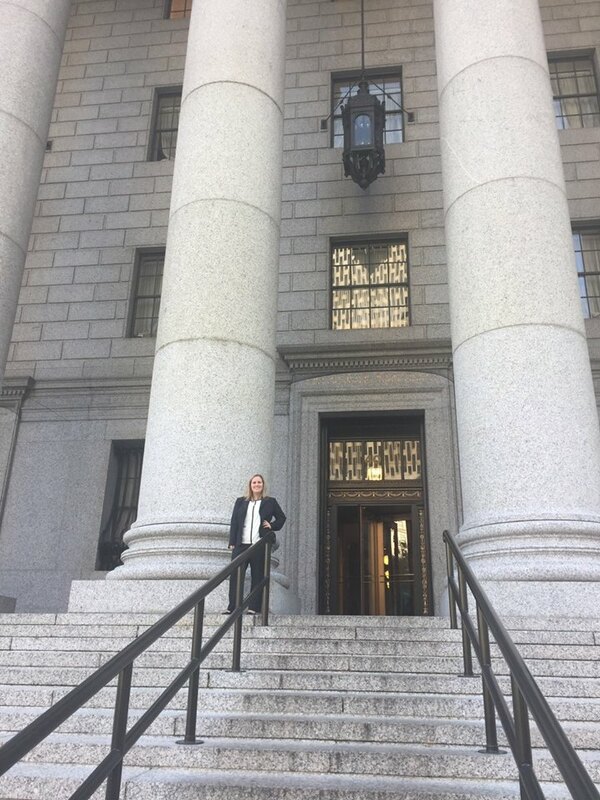 One of our interns, Kara Paulsen, made a rare appearance for a law student in the Second Circuit Court of Appeals today, arguing on behalf of our client Stop the Pipeline in the Constitution Pipeline case. Kara did tremendously, and the vibes from the panel were good. Here she is looking very intimidating in front of the building. Hopefully we'll get a good result soon . 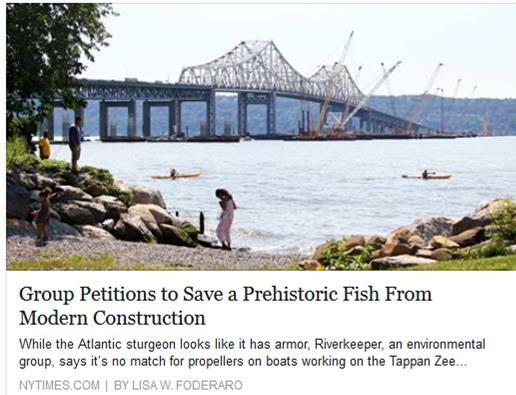 . .
New York Times, 7/22/15: Group Petitions to Save a Prehistoric Fish From Modern Construction Excellent coverage of the NMFS sturgeon petition we filed on behalf of Riverkeeper. Prof. Estrin is quoted near the end of the article. Our clinic has filed a lawsuit challenging New York State’s effort to utilize $511 million from its Clean Water Act State Revolving Fund (CWSRF) to finance components of the ongoing Tappan Zee Bridge construction and replacement activities. The clinic is currently working on papers in opposition to three motions to dismiss filed by private law firms on behalf of the various state agencies and officers sued by our clinic. We argue that this illegal and unprecedented loan would divert money from communities across the state in dire need of water infrastructure improvements. 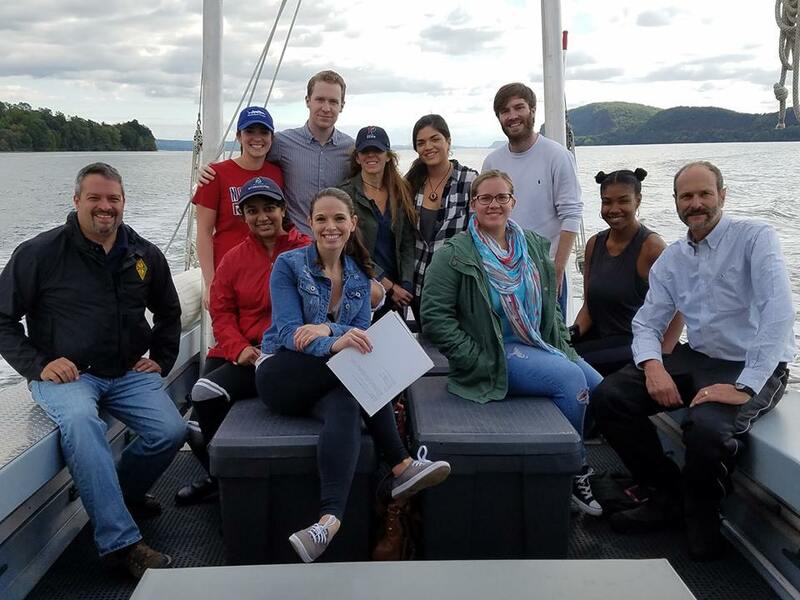 The clinic has carefully followed the Tappan Zee Bridge project for nearly 7 years and represents various environmental groups including: Riverkeeper, Inc., Waterkeeper Alliance and Environmental Advocates of New York. The lawsuit has been covered in various media news outlets, including this recent Rockland County Times article. Our clinic has completed briefing on EPA’s appeal of the summary judgment ruling in our favor in our challenge to the water transfers rule. We expect argument will be scheduled before the Second Circuit this summer. For a quick recap on the history of our advocacy in this case, click here. 1. Our Clinic has just filed a petition for writ of mandamus against the Federal Energy Regulatory Commission (FERC) in the Second Circuit. The petition seeks to compel FERC to rule on a request for rehearing of an order granting Constitution Pipeline Company a certificate of public convenience and necessity. 2. We (with our excellent local counsel) just commenced a new federal lawsuit against Frasure Creek Mining in the Eastern District of Kentucky alleging that the mountaintop removal coal mining company is again falsifying its discharge monitoring reports and violating the effluent limitations in its Kentucky Pollutant Discharge Elimination System permits. 3. We (with co-counsel Earthjustice) filed an Article 78 challenging the New York State Department of Environmental Conservation’s negative declaration of environmental significance under SEQRA with regard to Global Companies’ application to modify its Title V air permit to install boiler equipment at its terminal in downtown Albany. The boilers would allow Global to heat heavy crude oil (such as Canadian tar sands), which would plainly carry with it a risk of significant adverse environmental impacts. Our suit seeks to annul DEC’s negative declaration and garner a positive declaration of environmental significance under SEQRA and the preparation of an environmental impact statement. Our clinic has been involved since the late-1990s in litigation involving dirty water transfers, i.e., diversions of water containing pollutants from one water of the U.S. into another, distinct, water of the U.S., without an NPDES permit. 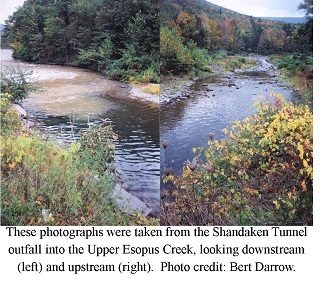 The Clinic’s earliest work on this issue was in connection with the City of New York’s operation of the Shandaken Tunnel, and the resulting despoiling of the Upper Esopus Creek, a world-renowned trout stream in the Catskill Mountains. See Catskill Mountains Chapter of Trout Unlimited, Inc. v. City of New York, 273 F.3d 481, 489 (2d Cir. 2001) (“Catskills I”), adhered to on recon., 451 F.3d 77 (2d Cir. 2006) (“Catskills II”), cert. denied, 549 U.S. 1252 (2007). This litigation, and another series of citizen suits in the Southern District of Florida, led to a frantic effort, primarily by western water owners, to lobby the George W. Bush administration for help. This effort ultimately led the Bush EPA to promulgate a regulatory NPDES permit exemption, which was finalized in 2008. Under its “Water Transfers Rule,” EPA attempted to exempt transfers of polluted water from one waterbody into another waterbody from the statutory requirement that all point source pollutant discharges into waters of the United States be made in accordance with the requirements of a NPDES permit. Under this unwise and illegal regulation, salt water could be transferred into fresh water; sediment-laden water could be sent into clear drinking water reservoirs; warm waters could be pumped into cold water habitats; chemical laden waters could be dumped into waters employed in farm and ranch irrigation; and invasive species could be transferred into waters not yet infested—all without the human health and ecological protections guaranteed by a NPDES permit. This flies in the face of the Clean Water Act’s plain and unambiguous discharge prohibition, the concept of water quality standards protecting uses of specific waterbodies and waterbody segments, and the Act’s primary objective to “restore and maintain the chemical, physical, and biological integrity of the nation's waters.” 33 U.S.C. § 101(a). On behalf of twelve environmental and fishing NGOs, our clinic sued EPA to challenge the Water Transfers Rule. Other groups also sued in other courts, and after years of jurisdictional battles concerning whether the various challenges to the final rule were properly brought in the courts of appeals under CWA § 509(b)(1), or in the district courts under the Administrative Procedure Act, the challenges were consolidated in the U.S. District Court for the Southern District of New York. The State of New York, along with eight other states and the Canadian Province of Manitoba filed a separate complaint in the Southern District, and their lawsuit was consolidated with ours. The Miccosukee Tribe of Indians and several other environmental groups then intervened in the case as plaintiffs, and ten western states and dozens of water owners intervened as defendants in support of EPA’s final rule. After extensive summary judgment briefing in 2013 and four hours (!) of oral argument in December, on March 28, 2014, U.S. District Judge Kenneth Karas issued an Opinion and Order granting summary judgment to the plaintiffs and invalidating the Water Transfers Rule. In his decision, Judge Karas determined that the Clean Water Act is ambiguous with respect to whether NPDES permits are statutorily required for polluted water transfers, and that EPA’s interpretation thus passed muster under Chevron step I (we disagree with this conclusion). However, in a meticulous Chevron step II analysis, Judge Karas found the Water Transfers Rule invalid on several grounds, including, (1) that EPA’s methodology in answering the question left open by the purported statutory ambiguity was “flawed;” (2) that even if EPA’s methodology had been sound, the agency arbitrarily and capriciously applied its methodology; and (3) that EPA reached flawed conclusions because it failed to consider alternative interpretations and to demonstrate how the option it did choose was consistent with its analysis of congressional intent. Judge Karas also disagreed with the 11th Circuit’s holding in Friends of the Everglades v. South Florida Water Management District, 570 F.3d 1210 (11th Cir. 2009) (in which that court found the Water Transfers Rule valid under Chevron in the context of a citizen suit appeal) because he found that court had deferred to an interpretation that had been advanced by another party to the litigation and not by EPA. In so finding, Judge Karas importantly also ruled that EPA had not in fact adopted the “unitary waters theory” when it finalized the Water Transfers Rule. This argument was advanced in briefs filed by our clinic, and was not made by any other party to the litigation. Approximately one dozen Pace Law School 2L and 3L students have greatly contributed to our efforts in this case, and several of them have addressed the court at various conferences and for oral argument on motions over the past six years. The two students listed as supervised by Professors Coplan and Estrin in the Opinion and Order—Ted Teyber and Conor Walline (both J.D. ’14)—actually argued the summary judgment motion against the Department of Justice, the City of New York and other intervening defendants in December. Unfortunately, EPA and all of the intervening defendants have appealed Judge Karas’s decision to the U.S. Court of Appeals for the Second Circuit. These appeals will be briefed this fall. Based on the Second Circuit’s earlier rulings in our Shandaken Tunnel case (cited in the first paragraph, above), we are confident that the Court of Appeals will ultimately affirm Judge Karas’s invalidation of the Water Transfers Rule. The New York City Department of Sanitation has been trying for several years to construct and operate a 20-acre solid waste management facility within Spring Creek Park, a waterfront park that straddles East New York, Brooklyn and Howard Beach, Queens. Our clinic has been working for just as many years to block this illegal project and to protect the communities’ continued recreational use of the park. While Spring Creek Park has never been improved or developed by the City’s Department of Parks and Recreation as one might expect of a traditional city park (think Central Park in Manhattan and Prospect Park in Brooklyn), it has served as one of the few open spaces upon which local urban residents have traditionally recreated, i.e., fished, crabbed, biked, walked dogs and played ball. It is immediately evident from the evidence submitted to this Court that the operation of the Spring Creek Facility precludes the use of the 20 acre portion of the Park for recreational enjoyment by the public. 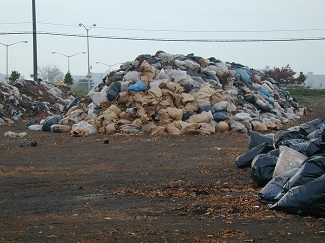 The subject area is fenced in and operated as a solid waste management facility and there is no real dispute between the parties that the composting facility is set aside and unavailable for use by the public. 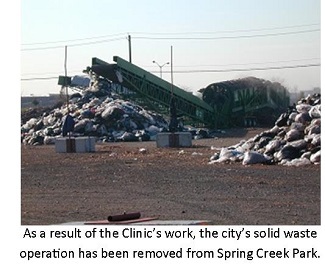 In reviewing the supporting evidence for the motion and cross-motion, the Court finds that the actual use of the Spring Creek Facility is a large scale solid waste facility, which is inaccessible to the public and provides no typical benefits that are expected of a park. The scope of the Facility also makes clear to the Court that the Department of Sanitation is using Spring Creek Park as a central location to collect all types of organic waste from locations including and beyond Spring Creek Park. The reality is that the Parks Department has burdened Spring Creek Park with serving as a solid waste processing facility for the general area at the expense of its local residents. It is impossible to consider the recycling and composting being performed at Spring Creek Park, to be an acceptable park use. The public is denied the use of the 20 acres of Spring Creek Park and the type of solid waste processing that is being undertaken is a use that presents no aesthetic or enjoyable appearance or activity typically associated with leisure and recreation. Notably, while the court granted summary judgment to the clinic’s clients, and issued a preliminary injunction prohibiting the City from operating the facility, it also temporarily denied our request that the City be enjoined to remove all of the fences and berms and fully restore public access to the park. The court’s reasoning was that the City should be given reasonable time to retroactively seek state legislative approval for its illegal alienation of parkland if it so chose. The time allowed by the court for the City to seek such approval just passed, and the clinic intends to return to court in the near future to renew its request that the court enjoin the City to return the fenced-off parkland to the public for its continued use and enjoyment. While the majority of our clinic’s work is on lawsuits we file on behalf of clients, we also often file amicus curiae briefs in lawsuits in which we do not represent a party. 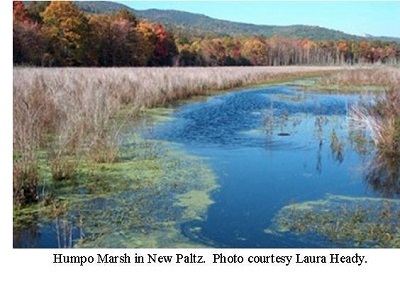 Last summer, we were asked by the Town of New Paltz, New York to consider filing an amicus brief in the Appellate Division, Third Department (New York’s intermediate appellate court) in support of the town’s local wetlands law, which had been struck down by a trial court judge. The lower court had based its annulment of the local law on numerous grounds, including that it was unconstitutionally vague because it did not sufficiently identify the precise location of every regulated wetland, watercourse (vernal pools, etc.) within the town. Instead, the law referenced state and federal wetlands maps as a starting point in the development of an official town wetlands map. The law also provided for delineations by the town’s wetlands inspector free of charge to property owners to determine whether a regulated area existed that would impose a permit requirement for any particular development project. The town’s wetlands map would then be continually updated to reflect these delineations. The clinic’s work on its amicus brief involved an extensive survey and analysis of every local wetlands law in the State (we identified and analyzed approximately eighty such laws) for purposes of substantive and procedural comparison to the town’s enacted law. We found the town’s law to be no more vague, and far less onerous, than most other wetlands protection laws in New York State. On April 24, the Appellate Division issued a Memorandum and Order reversing the lower court’s order and reinstating the town’s wetland law. In its decision, the court specifically referenced our amicus brief and local law survey (see footnote 3). A few Clinic legal interns worked on this matter, but we’d like to give a special hat-tip to Lauren Bachtel (J.D. ’13), who did much of the “grunt work” on the extensive survey of state wetlands laws. Hudson Riverkeeper staff attorneys Mike Dulong and Krista Yacavone also made invaluable contributions to this effort. I want to thank you and your team for your help on this appeal. I was pleased to see that Justice Garry cited your amicus brief in support of her decision. Your survey was excellent. Unless you know of another decision, I believe this is the first court decision, let alone appellate decision, expressly upholding the regulation of vernal pools in the face of both SEQRA and constitutional challenges. Thanks again for supporting this effort. United States District Judge Kenneth Karas issued a decision and order on 3/28/14 granting our clients summary judgment in our challenge to the U.S. EPA's "Water Transfers Rule." Under this illegal and misguided rule, salt water could be transferred into fresh water, sediment-laden water could be sent into clear drinking water reservoirs, warm waters could be pumped into cold water habitats, chemical laden waters could be dumped into waters employed in farm and ranch irrigation, and invasive species could be transferred into waters not yet infested—all without the human health and water quality protections guaranteed by a CWA discharge permit. The Clinic has been working on this case since the rule was finalized by EPA in 2008. We will report on this development in more detail, but wanted to share this important news! January 7, 2014 New York Law Journal (front page) article about the Clinic's recent victory in the Spring Creek Park case. The article can be found on pages 1 and 7 of the linked PDF. Kings County (Brooklyn) Supreme Court Justice Bernard Graham granted a motion for summary judgment that we filed in April and argued in June. The court ruled that the City of New York’s use of 20 acres of Spring Creek Park in southern Brooklyn as a solid waste management (composting) facility without State legislative approval violates the common law public trust doctrine. The decision can be accessed by clicking the link below. In its decision and order, the court granted our clients preliminary injunctive relief, enjoining the operation of the facility unless and until State legislative approval is obtained (we view this as unlikely). The court also gave the City six months to obtain such legislative approval, at which point we may renew our clients' application for an order enjoining the City to remove the fences and bulldoze the berms that surround the illegal facility to return the encumbered parkland to the public for recreational uses. This is a huge win for NY/NJ Baykeeper and the members of the East New York/New Lots community that our clinic represents in this case. We do not know at this point whether the City will appeal. More than a dozen of our clinical interns have worked on various aspects of this case (including a two year DEC adjudicatory permit hearing) over the past nine years. We tip our hats to two Clinic interns in particular—Adam Weiss (’13) and Nicole Sasaki (’14)—who did the lion’s share of research and drafting of these motion papers. Nicole also argued the summary judgment motion before Justice Graham in June.